Declining oil prices and continued losses of contracts keeps dragging down shares of Transocean, Seadrill, Ensco, Atwood Oceanics, Noble Corp, and Diamond Offshore Drilling. What: No offshore drilling company was safe this past month as shares of Transocean (NYSE:RIG), Seadrill (NYSE:SDRL), Ensco (NYSE:ESV), Atwood Oceanics (NYSE:ATW), Noble Corp (NYSE:NE), and Diamond Offshore Drilling (NYSE:DO) all declined more than 10%. The largest driver of this was lower oil prices that puts offshore production out of the money, but a slew of delayed contracts and early terminations has weighed on all of these stocks. So what: The backdrop for all of these companies' misery is from a large decline in oil prices we saw last month. After a long, slow increase in oil prices this year to around $50 a barrel, last month oil prices lost ground again to the $40 per barrel range. The reason this price is significant is because some companies had voiced some interest in drilling again if oil prices could remain in that $50 range for the rest of the year, but this backslide could delay those decisions even more. For almost all of the companies here, July also led to either the end of certain contracts with customers without much new work to cover the losses. The only company with any significant contract additions came when Seadrill announced that it had agreed to three year extensions on two of its jack-up rigs that are contracted to Saudi Aramco. However, it those jack-up contracts are small in comparison to the contract rates that the respective companies here receive for their floating rigs. It's those floating rigs that will be the major drivers of profitability when demand for rigs eventually picks back up again. The small amount of good news for this industry came at the end of the month when Ensco and Noble Corp reported earnings at the end of the year. The most promising sign from these two companies was that they were both continuing to cut costs and scrap older rigs. 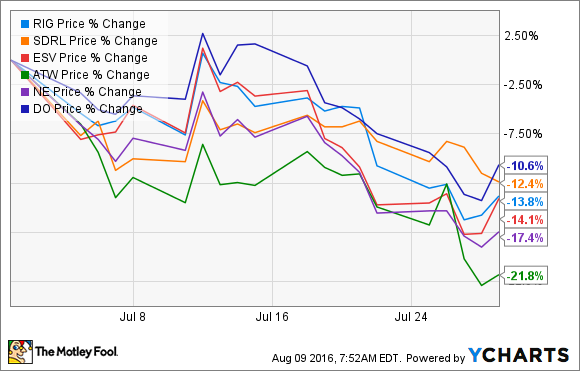 Transocean and Diamond Offshore also mentioned major cost cutting when they reported in the first week of August. Now what: The big issue for these offshore drillers is that offshore exploration and production is going to be one part of the production mix that will see a recovery last. With the rapid decline in costs for shale drilling, many producers have shifted their budgets to focus on these less expensive, faster to develop sources of oil. This isn't to say that a recovery won't come for the offshore market, it's just going to take a while longer until it happens. For the most part, all of the companies here have done something drastic to cut spending and preserve some semblance of balance sheet strength. Ensco and Seadrill have both recently issued equity to pay down some debt, while Atwood, Transocean, and Seadrill have all been able to push back deliveries of newer rigs to keep from having to make payments on them. The hope of all of these moves is that they will be able to put off their cash spending needs long enough that those assets are needed and not just sitting on the dock eating up operational cash. Despite moves to make their businesses able to fight for another day, we're still a ways away before we see a recovery in this part of the oil and gas business, so investors shouldn't feel any urgent need to jump into these stocks any time soon. After all, as we've seen, a lot can happen in a year or so in this industry.